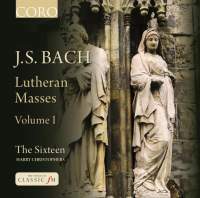 It’s getting harder to lament the curious neglect of Bach’s short or “Lutheran” Masses. Within recent memory I’ve had the privilege of auditioning new sets by Ton Koopman, (Challenge), Konrad Junghänel (Harmonia Mundi), and Raphaël Pichon (Alpha). Philippe Herreweghe’s excellent set was reissued by Virgin, and Brilliant has even revived Hanns-Martin Schneidt’s 1974 version in its complete Bach Edition box. Helmuth Rilling on Hänssler is still around. Now comes the first installment of a new set by Harry Christophers. Nevertheless, the short Masses do get considerably less attention than the cantatas, which they resemble in every way except for the absence of recitatives and closing chorales. The cantatas, after all, tell stories; the Masses do not. In fact, most—probably all—of the music in the Masses is recycled from pre-existing cantatas. In these performances Christophers has reduced The Sixteen by a half, to eight singers only: Grace Davidson and Julia Doyle, sopranos; Robin Blaze and William Purefoy, countertenors; Jeremy Budd and Mark Dobell, tenors; Ben Davies and Eamonn Dougan, basses. The voices are accompanied by a slightly larger instrumental ensemble: 3, 3, 2 (or 3), 2, and 1 of strings, plus the necessary winds and continuo. All of the singers take solo turns, except Doyle. The only soprano aria on the disc, in the F-Major Mass, went to Davidson. One lesson we might take from this release is that Bach rocks, although we already knew that. The Kyrie of the G-Minor Mass, a real toe-tapper, gets the ball rolling, and Christophers takes it from there, injecting the choral movements, especially, with abundant energy. The double quartet is very effective throughout. I was a little less enthralled by some of the arias, but not enough to discourage me from giving the whole enterprise a thumbs up. Because the combined Masses run just over 52 minutes, Coro has generously added a Cantata, No. 102, between the Masses, a welcome bonus. I’m looking forward to Volume II.